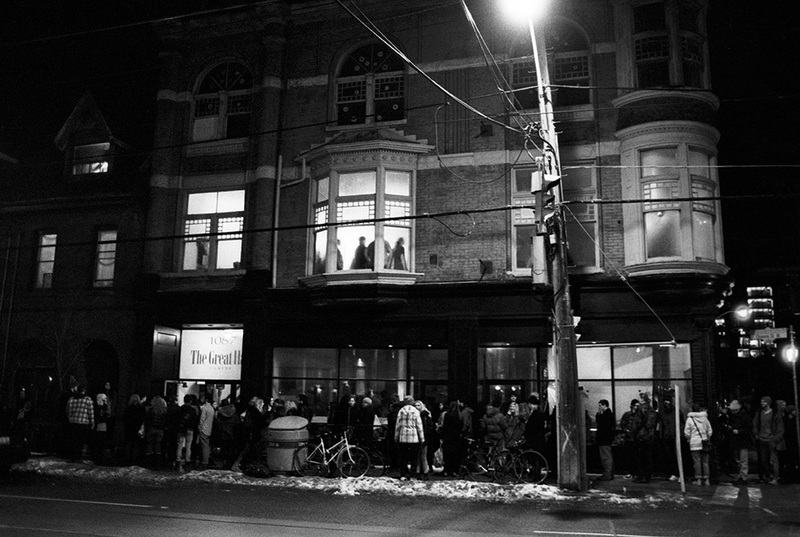 Following a July petition rallying support from 2,863 former guests and members of the surrounding community, West Queen West arts, banquet, and events facility the Great Hall has received government approval on a new plan to expand the building’s liquor-licensed capacity. After reviewing the venue’s proposal for a 1,250-person capacity increase at a July 30 court date, the Alcohol and Gaming Commission of Ontario (AGCO) offered the hall a compromised 940-person capacity increase for a maximum liquor-licensed venue capacity of 1,243 persons. While the AGCO-approved increase is 310 persons short of what the Great Hall’s petition called for, it authorizes the venue to welcome audiences more than four times the size of its currently licensed 303-person capacity. The nod could effectually lend the Great Hall a competitive blessing in a city district that has been significantly transformed by developers over the past decade. But some significant changes need to happen first. “Unfortunately we have to do some renos before it’s all official,” Great Hall production manager Mark Foster told Long Winter in a Sept. 13 interview. Foster began working at the hall in February 2010, just before it was purchased by Wrongbar owner Nav Sangha and the Lakeview Restaurant’s Fadi Hakim and Alex Sengupta (the building was sold to a new company called Triangle in September, but Foster and Sangha will remain in place as the venue’s bookers and operators). He’s been employed at the hall long enough to witness its most recent transition from a space that was chiefly being used for weddings and corporate events into a major concert and arts venue, but he says the building’s infrastructure has since remained more or less the same. As it is currently configured, the four-storey building lacks the accessibility required to accommodate larger audiences. Entrance to the main hall requires guests climb a full flight of stairs, and another to reach the seated balcony area above it. The only publicly accessible washrooms in the building are located (1) on the second floor in a hallway between the main hall and the Conversation Room (a passage that experiences significant bottleneck traffic during the venue’s multi-room events), and (2) downstairs via the street level restaurant, the Bristol (which typically operates separately from the events facilities). Before it can operate under the new capacity approved by the AGCO, Foster says the venue will first have to install further soundproofing, a new heating, ventilating, and air conditioning (HVAC) system, a wheelchair lift, and additional bathrooms accessible to the third floor as well as its basement theatre space, the BlkBox. Whereas the building’s current licensing only allows guests to purchase beverage alcohol in the main hall and the Bristol, Foster explained the new license will legally extend the venue’s liquor sales to bars in the BlkBox, the Bristol, the Conversation Room, the main hall, and the main hall balcony. While Studio 3 – the building’s aptly titled third floor studio space – will remain available to rent for events, Foster says its facilities couldn’t be included in the licensing increase granted by the AGCO. Before the building can pursue any of its renovations, a structural engineer will also have to create professional drawings documenting the venue’s present layout in order to request a building permit from city hall. With all of the variables at play, Foster estimated the new capacity would take “earliest four, latest eight to 10 months” to come into effect. Regardless of the time it takes for the building’s capacity increase to come into effect, its eventual implication will serve as a critical step forward in the long-term context of the Great Hall’s survival. Built in 1889 by Moore Corporation founder Samuel J. Moore and designed by architecture firm Gordon & Helliwell, the Great Hall began its existence at the corner of Queen Street West and Dovercourt Road as the city’s West End YMCA, and has since played home to the Royal Templars of Temperance, who used the space to host political speeches, entertainment, and even a séance; the Polish National Union, which printed copies of The Polish Voice newspaper on the ground floor and used rooms on the building’s fourth floor to temporarily shelter Polish refugees fleeing Europe during the Second World War; visual art gallery YYZ; and important Toronto institutions like the Music Gallery, the Theatre Centre, and the Toronto School of Art. It received heritage designation in 1973. Now in its 125th year of operation, the Great Hall has racked up an impressive track sheet acting as a city cultural hub, but the surrounding neighbourhood has changed dramatically over the past ten years. Stationed at the northeastern corner of the West Queen West Triangle – a wedge of land bounded by Queen, Dovercourt, and the rail corridor – the Great Hall exists on the periphery of a chunk of city space that developers have spent the last decade scrutinizing and transforming from a wasteland of neglected industrial buildings into a commercial gold mine. Two short blocks west, the Drake Hotel became a symbol for the neighbourhood’s gentrification when it was transformed from a cheap rooming house into a hip nightclub and concert venue in 2004, and despite the early efforts of Active 18 – a Ward 18 citizens, residents, and business-owners association that formed in 2005 – comparatively posh residential towers sprouted left and right in the years that followed. The Great Hall’s heritage designation would be a major barrier to developers hoping to repurpose the building’s main hall and basement spaces into viable living spaces – let alone a condo – but its large floors could serve as fertile grounds for retail centres hoping to tap into the higher incomes recent revitalization has attracted to the neighbourhood. “That’s something that can happen. Anybody could take over the space,” said Foster. “It’s hard to imagine our main hall as a furniture retail centre, but stranger things can happen. Especially in this city.” The same fate befell three-storey Queen and Bathurst nightclub the Big Bop, which closed shop in 2010 and became a (Crate & Barrel sister store) CB2 location in 2012. With a quadrupled capacity, however, the Great Hall is poised to substantially increase its business and benefit from the neighbourhood’s recent densification. Now it’s just a matter of giving city hall and the AGCO what they want. Long Winter returns to the Great Hall for its third season of programming on Nov. 14.